In the short-term, deepwater exploration is expected to be delayed; companies will prioritise commitment wells and target higher probability (usually near-field) prospects. On the other hand, short-term production should remain on target and development of sanctioned projects is expected to proceed. In the longer-term, deepwater reserve replacement could potentially be affected by near-term exploration delays. 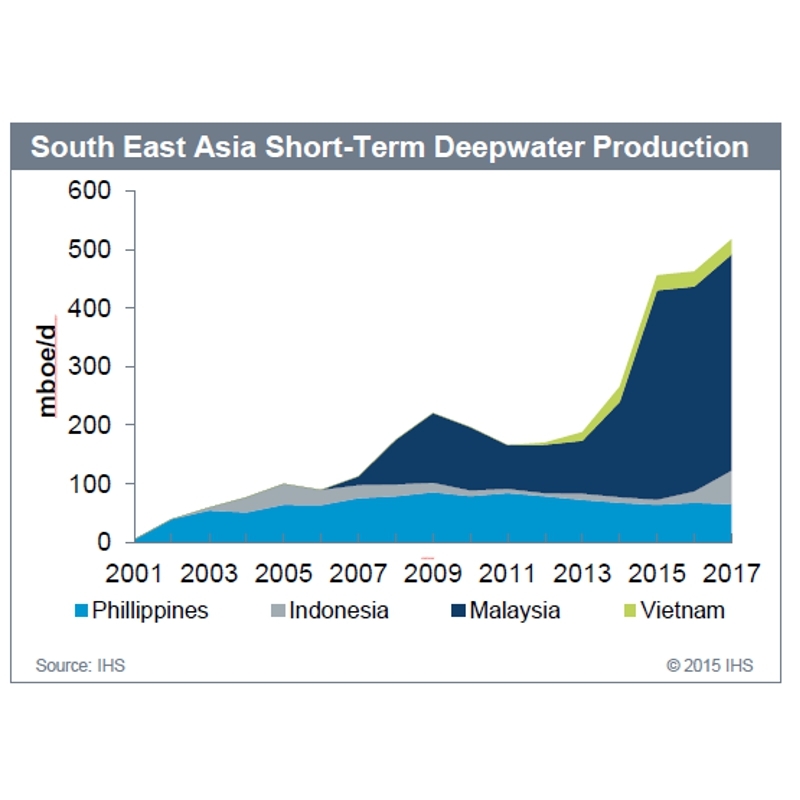 When combined with possible delays in project sanctioning over the next one to two years, there is less certainty on the long-term deepwater production outlook for South East Asia. Capital spending could be redirected to mergers and acquisitions as companies take advantage of low oil prices to consolidate and optimise positions in core operating areas. South East Asian governments are expected to play a more active role in encouraging deepwater E&P through additional fiscal incentives and prioritising diplomatic resolution of disputed acreage, with the aim of replenishing reserves for energy and fiscal security. Map of South East Asia showing areas of deepwater drilling activity between 2000 and 2014. From 2000 to 2014, deepwater new field wildcats (NFWs) accounted for 13% of total NFWs drilled in the region. Deepwater contributed an additional 11 Bboe of discovered resources, representing 38% of total reserves discovered in the region. 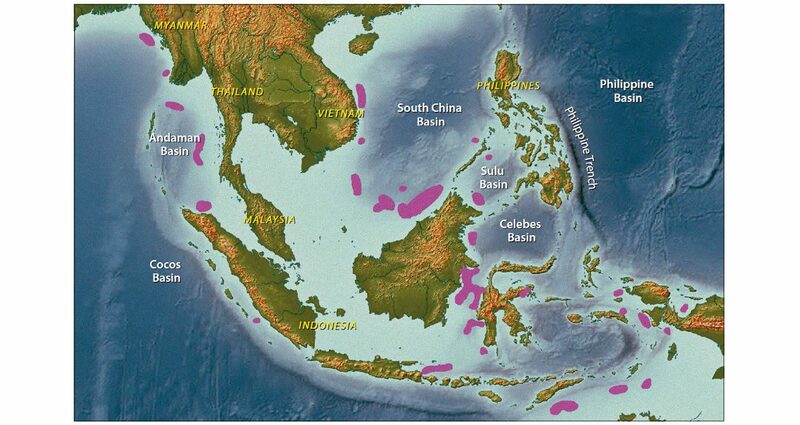 Deepwater development in South East Asia has historically been driven primarily by the international E&P companies. The largest deepwater operators in the region are Chevron, Murphy and Shell, each operating more than ten fields. Domestic national oil companies (NOCs) such as PETRONAS and Pertamina established their deepwater positions through initially holding non-operated stakes. However, as the NOCs refine their deepwater operational capabilities, they will become less reliant on international partners to drive deepwater development in their domestic basins. 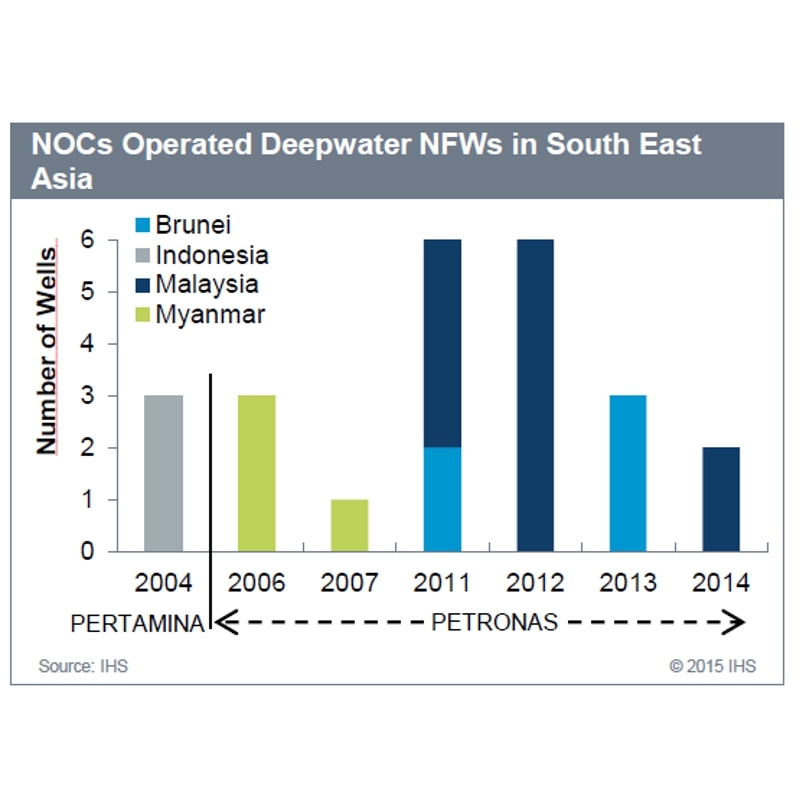 Over the past four years PETRONAS has drilled 17 operated deepwater NFWs in the region. Meanwhile, in Indonesia Pertamina has been pushing for an operator stake in the TOTAL-operated Mahakam Offshore PSC, which is due to expire in 2017. Despite relatively higher finding and development (F&D) costs compared to onshore and shallow water plays, deepwater is still attractive to companies in pursuit of reserves replacement due to the potential to find larger-sized fields. However, deepwater drilling with higher initial capital risk is expected to face high risk of delays in an environment of weak and volatile oil prices as E&P companies review their portfolios to reduce operational and capital spending. Major E&P companies across the globe have announced significant spending cuts in response to the recent collapse in oil prices. Shell announced a spending cut of $15 billion over the next three years, Chevron a cut of $5 billion for 2015 and PETRONAS has stated there will be reductions in 2015 capital spending of between 15 and 20%. Murphy plans to cut 33% of capital spending but will, however, be maintaining its current focus on global deepwater assets. The impact of spending cuts on producing projects or projects already sanctioned, especially those expected to come onstream in the next year or two, are expected to be limited in light of existing contracts and commitments. As a result, the short-term production outlook for South East Asia is expected to remain relatively unchanged. Malaysia is forecast to be the largest contributor of short-term production growth, underpinned by the Kebabangan Gas Project, which came onstream in late 2014. The project is operated by KPOC, a joint operated company comprised of PETRONAS, Shell and ConocoPhillips. On the exploration front, E&P companies will be forced to reevaluate exploration opportunities set within their portfolio in light of spending cuts. Subsequently, testing of deepwater prospects has a greater chance of being delayed due to associated higher costs and lower estimated possibility of economic success. E&P companies will likely target higher probability (near-field) drilling prospects when fulfilling their exploration commitments. Rig utilisation in South East Asia has already been in decline since late 2013 due to oversupply. Potential deferrals of exploration drilling and project sanctioning are going to add further downward pressure on rig demand. Reduction in drilling rig rates and services and the easing of tight labour pressures are expected to result in the decline of upstream capital cost over the next two years. In the long-term, production volumes at risk from low oil prices will depend on how far down prices go and for how long they remain at that level. IHS estimates an average operating cost of US$15 pboe for deepwater projects in South East Asia, which requires a drastic and sustained drop in oil prices possibly below US$35 pbo to render the operating costs of these projects uneconomical. As major international E&P companies reassess their global portfolio in an effort to manage cost and cash flow in the near-term, deepwater projects are at high risk of delayed sanction – projects in Brazil, West Africa, and the US Gulf of Mexico are among those at risk. While deepwater project economics might appear feasible due to the expected recovery of oil prices in the long run and the long lead time of six to ten years from final investment decision (FID) to first production, in a volatile price environment companies will seek to conserve cash to support core operations and avoid committing to capital-intensive projects. In August 2014, Chevron delayed taking FID on the Gendalo-Gehem project. In addition, low oil prices could further exacerbate FID deferments for the 2.5 MMtpa Abadi FLNG project and the second phase of the Indonesia Deepwater Development project, which were still pending FID prior to the onset of low oil prices. All three projects are located in Indonesia. 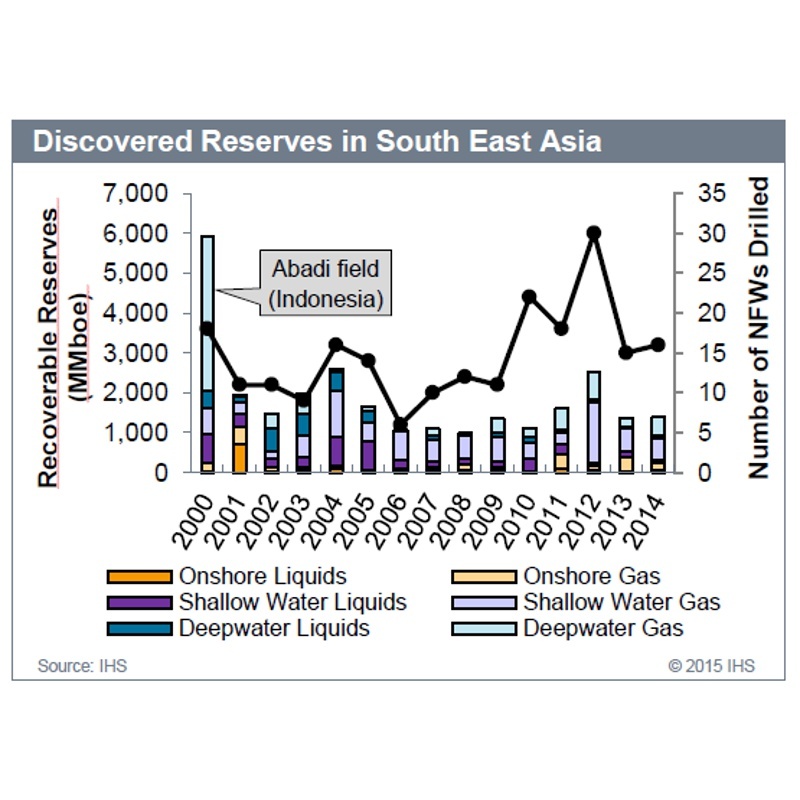 Delays to exploration drilling over the next year or two could potentially foster a decline in deepwater reserves replacement in South East Asia. This will have a further impact on the longer term production outlook for the region. The deepwater competitive landscape in South East Asia is not expected to undergo significant changes as companies invested in the region, such as Chevron, Murphy, Eni and TOTAL, are financially able to withstand low oil prices for sustained periods. Operations in the region are material and core to many of these companies. NOCs, such as PETRONAS, Pertamina, CNOOC and Sinopec, are also likely to retain their equity stakes in current contracts to maintain position in the region. While it is unlikely that there will be significant M&As in the region targeting deepwater assets, the number of upstream M&A transactions for global assets might see an uptake as the cost/boe to acquire becomes more attractive than cost/boe to explore. 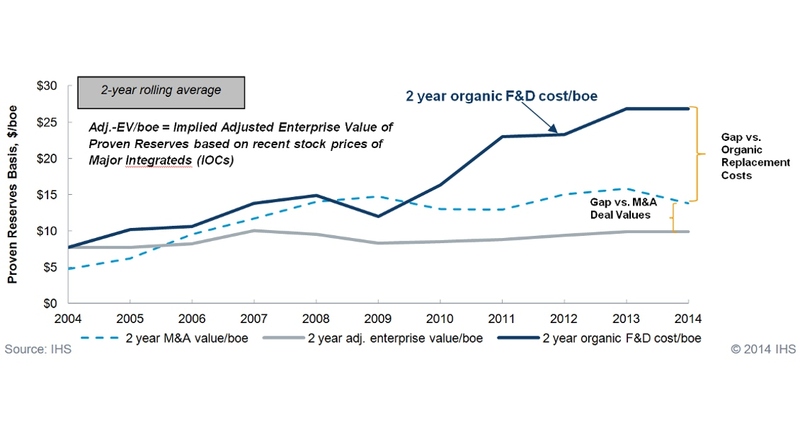 Companies could take advantage of low valuations to acquire assets from distressed companies that are of strategic fit to their portfolio. The potential shift to growing inorganically could result in the delay of greenfield deepwater exploration. South East Asian governments have been relentless in their efforts to promote deepwater exploration in the region. In December 2014, the Indonesian government implemented a Land and Building Tax exemption for 22 onshore/offshore exploration blocks. The tax relief scheme will be granted to exploration licence holders for a period of six years. Moreover, Indonesia will also issue extensions for the 42 blocks estimated to expire between 2015 and 2019 and the government has announced plans to simplify business process for obtaining licences. All these were efforts undertaken to stimulate exploration activities in the country. Yet, the economics of deepwater projects in the region remain challenging given the high cost environment, lack of technical expertise, and export route barriers. The prolonged contested maritime territorial claims and China’s recent aggressive move in the South China Sea further complicate deepwater exploration. However, the recent drop in oil price may put a downward pressure on cost, thereby improving deepwater project economics. Capital cost for deepwater projects is less elastic compared to shallow water projects to price changes, therefore it may take one or two years to respond, given the typical longer term commitment on deepwater projects. Despite the low oil price, NOCs are expected to remain committed to deepwater plays, especially in their domestic basins. Going forward, South East Asian governments could potentially play a more active role in encouraging deepwater E&P through additional fiscal incentives and prioritising diplomatic resolutions on disputed acreage, with the aim of replenishing reserves for energy and fiscal security. With the right touch, it is possible to sustain deepwater exploration within a prolonged low oil price regime. Prime Minister, Narendra Modi, announces a new Hydrocarbon Exploration and Licensing Policy (HELP).